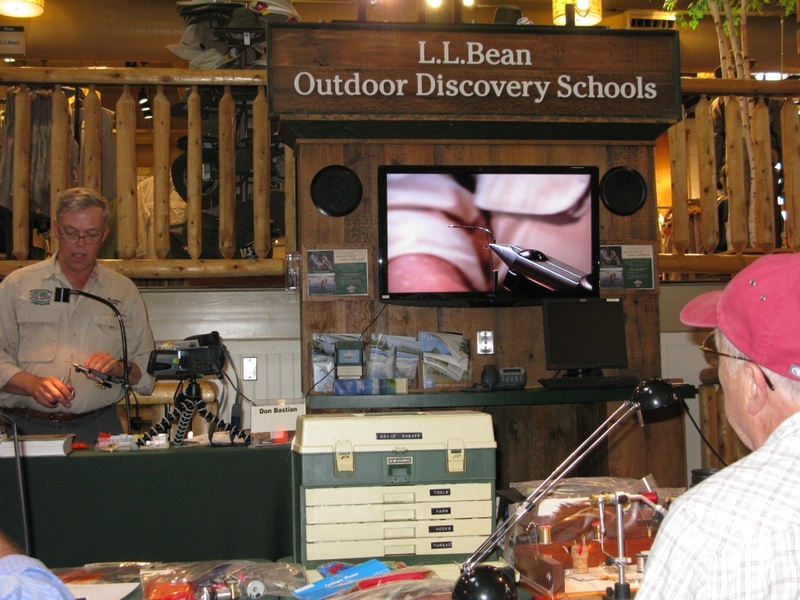 During the week before the L. L. Bean Spring Fishing Expo on March 16 – 18 I was tying a Footer Special for a customer while staying with my brother, Larry. The belly calls for dark blue bucktail, so I pulled one out of my drawer bin. I have one of the large size A. K. Best hairstackers that a friend from Maryland got for me a number of years ago. They work great for stacking bucktail. I have been grateful to my friend ever since. Don Corey was quick to reply, ” No, that is not just a hairstacker.” Several of the fellows present chimed in with supportive affirmation of Don’s comment. Of course I had to agree with their assertion. The large A. K. Best stackers are the best ones available for the purpose of stacking bucktail for streamers and bucktails. Problem is they are not made anymore. Those of us fortunate to have one are very protective of them. 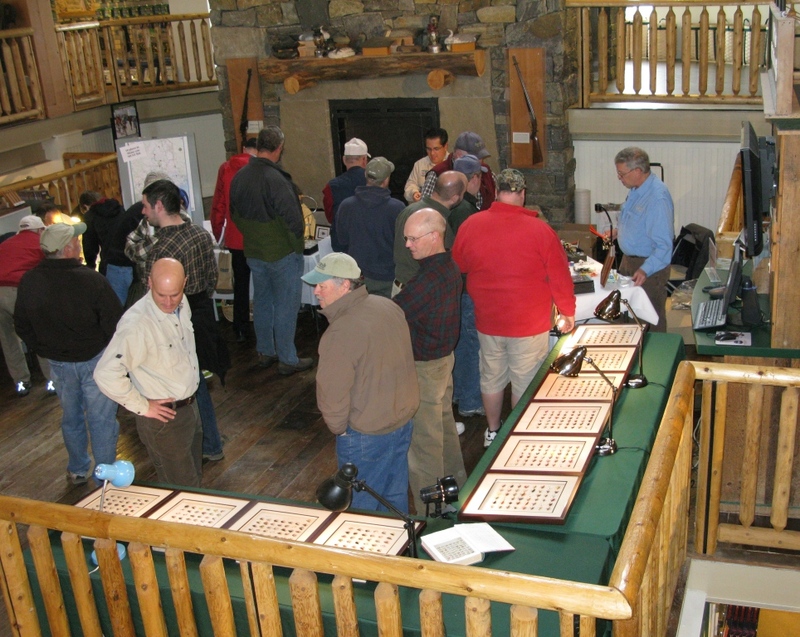 Chris Helm of Toledo, Ohio, operates a large fly shop by appointment and mail-order in his home Whitetail Fly Tieing Supplies (that’s how he spells tieing), and even though he’s nearing retirement and not actively promoting his catalog business he has his own brand of hairstacker that he had custom-made by the same machine shop that manufactures the A. K.Best hairstackers. I believe they sell for approximately $50. The best way to order one is to call him between 10 AM and 5 PM, Eastern Standard Time. Call to inquire: 419-843-2106. As I began tying the Footer Special I cut a section of blue bucktail, culled out the short hairs and inserted it into my stacker. But it just would not stack. Tap, tap, tap, and it would not stack. It was one of those tails that come in the package not completely cleaned from the dyeing process. It had a bit of waxy residue that made it sort of cling together, and that is a problem. 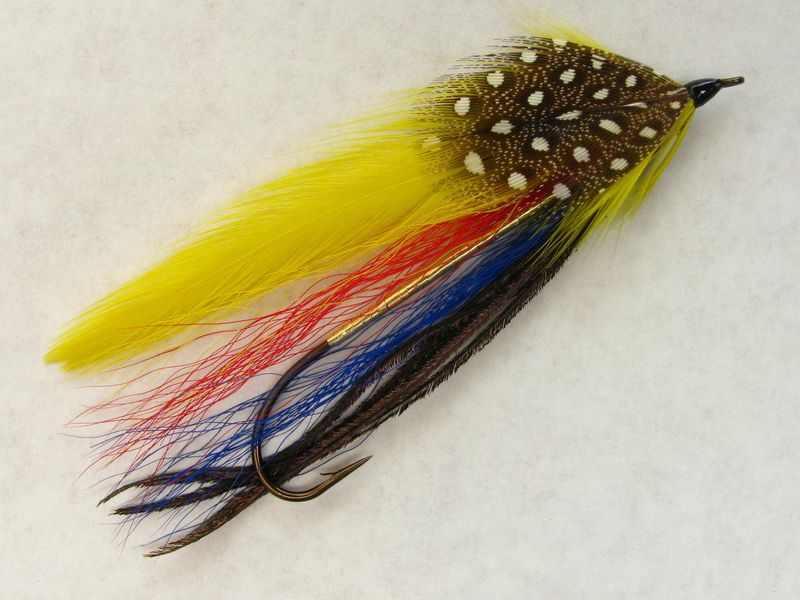 I don’t use that much dark blue in tying bucktails, and I have several full blue tails, but I had dealt with this one before. 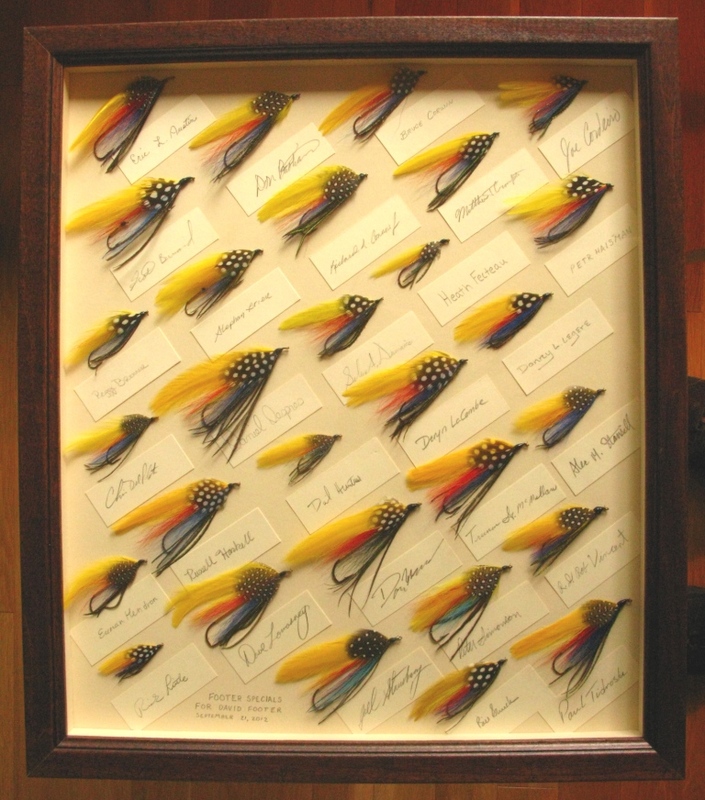 When you are stacking bucktail, there’s nothing worse than bucktail that won’t stack. Previously, whenever I encountered this problem on a particularly unruly and uncooperative piece of deer tail I just bagged it and found one willing to work with me. On this day I guess I wasn’t in a mood for it to be ornery with me, so out I went to the kitchen and dropped it into the dishpan. My brother has a Burnham hot-water boiler in his house, just like I do, a finely-made Pennsylvania product from the company in Lancaster. Solidly-built, American made. Imagine that. Mine is 33 years old and still runs like a reliable old truck. That model has a hot-water coil that also heats the domestic hot water. The element that regulates the temperature can wear out in a couple years, and when it does, you pretty much have no way to limit the upper temperature of the hot water. Caution at the sink is in order. My wife used to love it because the dishes were always squeaky clean. I gave a good squirt of dish soap and added hot water. A minute of washing, a minute of rinsing, then I took it outside to vigorously shake the excess water from it. This was one of those unseasonably warm March days, it was sunny and the back deck faces to the west. I stood it up on the railing against house and let nature take over while I located another dark blue bucktail to continue my tying. When dry, the formerly sticky bucktail was as clean as could be. It felt like your hair does when you wash it and apply conditioner. Soft, clean, silky, smooth, almost slippery, it was so nice. Sweet! I thought to myself. And the hide was still pliable. So I’m suggesting that any piece of bucktail or body hair that needs washed, it might be a good thing to do just that. 1) Avoid any stacker made of plastic. Static becomes an issue. There is a new one on the market with a see-through acrylic tube at the bottom, maybe nice to see the hair, but it’s a gimmick, not necessary to see your hair stack. 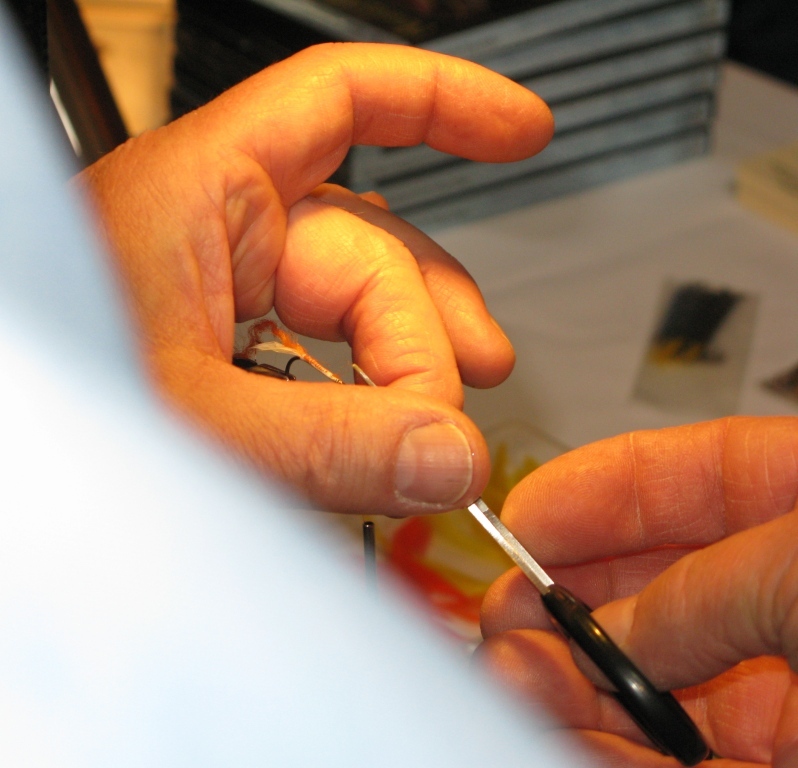 An idea generated by a well-meaning individual trying to separate unsuspecting consumers from their money non-fly tying tool designer, but that’s just a hazardous guess. One student last weekend had one and said he hated it because of static. I made the mistake once of thinking I could make cheap hairstackers to sell out of CPVC pipe. Bad idea. 2) Static: Use a comb, but never use a plastic comb. A metal comb, or the ones from Griffin Tool Company – that I used to think were plastic – no, they are made from solid steer horn, each one is cut individually. Steer horn is naturally anti-static. I have one and love it. And they have the feature of all being unique, because the variety of grain in the horn can add beauty to the surface. The one I have was hand-picked because it has a beautiful combination of being different on both sides, kind of a lovely wood-grain appearance to it, one side light and the other dark. Anyone who does much hair stacking needs a good comb; culling underfur is also imperative to good, clean stacking. 3) When you do encounter a bit of static, you can wipe your hair piece with a dryer sheet. Don’t confuse my mention of “hair piece” with a toupee. 4) If your hair sits at the top of your stacker without falling into the barrel, you need to clean your stacker. I have a nice metal stacker, hand-made, a gift from my machinist-hunting-fishing-fly tying friend Truman, the bottom is aluminum, the top is brass. The brass hairstackers on the market are nice, but you must be aware that when brass tarnishes, it’s dirty and impedes stacking. Cleaning works wonders on hairstackers. Use a Q-tip and metal cleaner, or a piece of Brillo pad separated and forced through the barrel; twist it and slide it back-and-forth to polish it up. 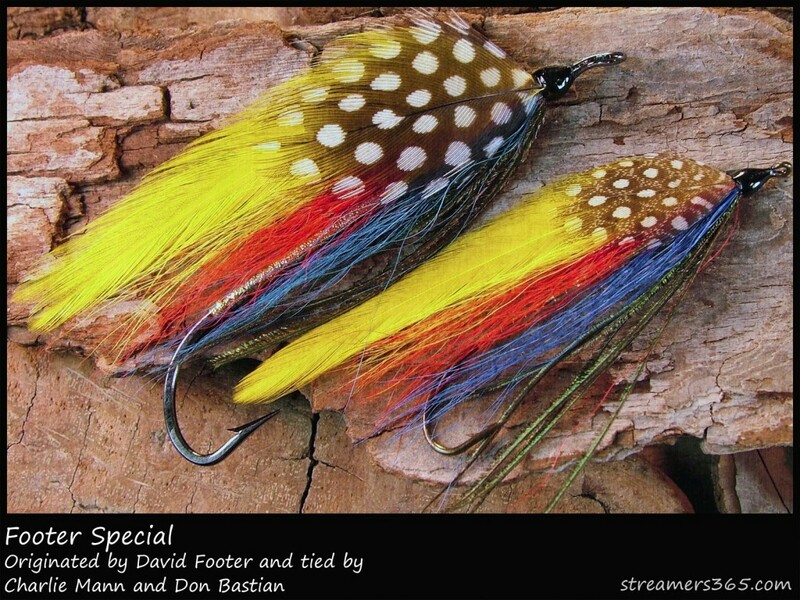 When I was tying commercially, Comparaduns were one fly I tied tons of, and I used to clean my stacker once a week. If you want to really make it stack effectively, apply a touch of car wax inside. Talk about s-m-o-o-t-h. A small piece of paper towel twisted and pulled through the barrel several times will polish it and finish the job. 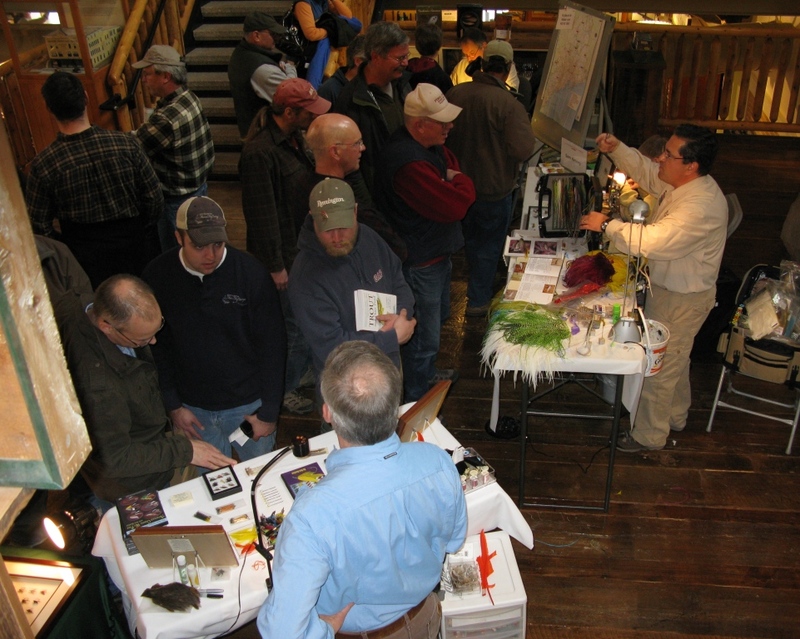 My friend “Quill Gordon,” the caretaker at The Wantastiquet Lake Trout Club in Weston, Vermont, where I believe I will be visiting again this year in June – has posted a very interesting, intriguing, tinged with his usual dry humor, and informative post on his blog, The View From Fish in a Barrel Pond. 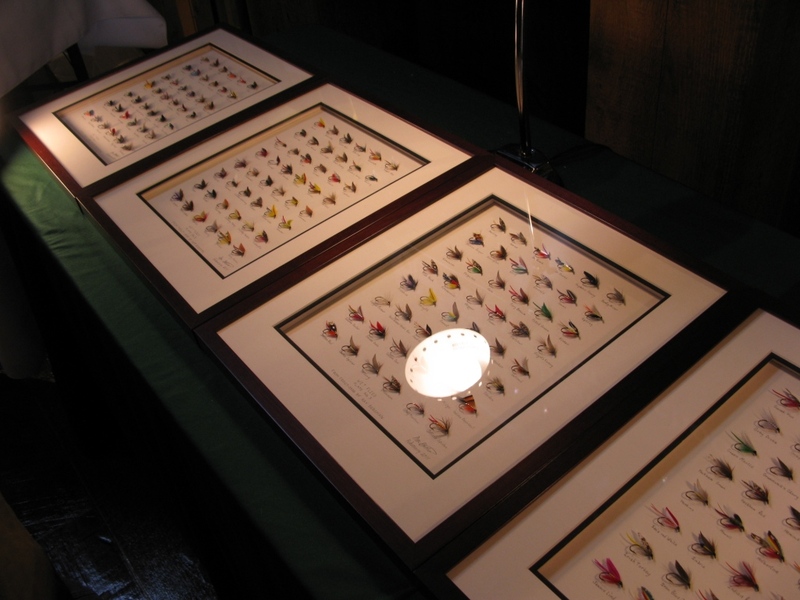 The post is titled; When Art Imitates Art, Good Fish Die.” In this blog he writes about the photographic recreation / replication / digitized reproduction of the cover of a 1933 LL Bean Catalog. This artistic effort was done by photographer Randal Ford, in conjunction with the 1912 founding of L. L. Bean Company in Freeport, Maine. 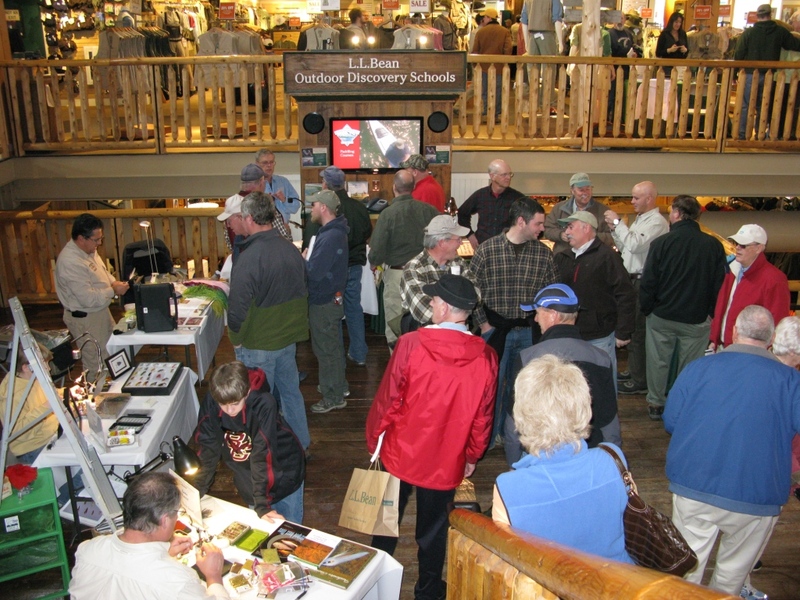 This year – 2012 – is the 100th Anniversary Year of L. L. Bean. 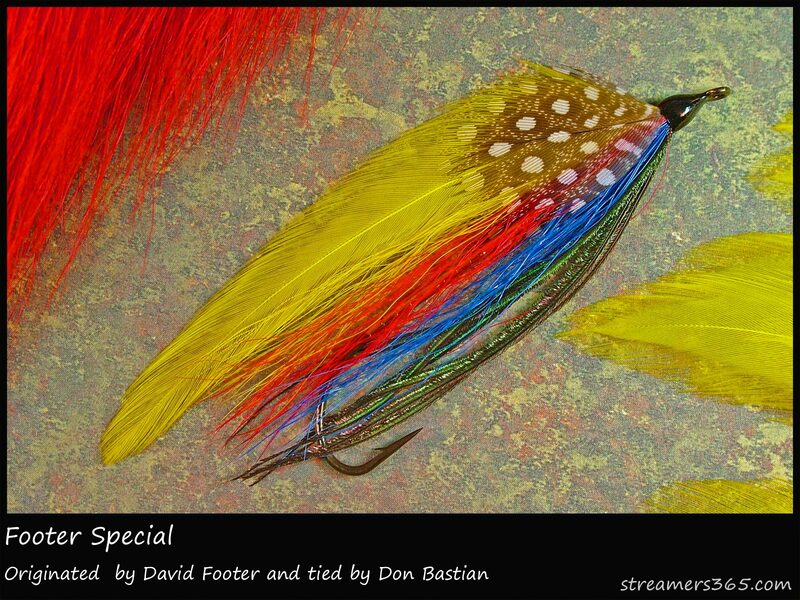 Quill mentions at the end of his post that Don Bastian (that would be me) is tying flies there on March 16th, and suggests you may want to drop by. I would enjoy that, and thanks, Quill, for the plug. I appreciate your support and enthusiasm, and I look forward to seeing you there! 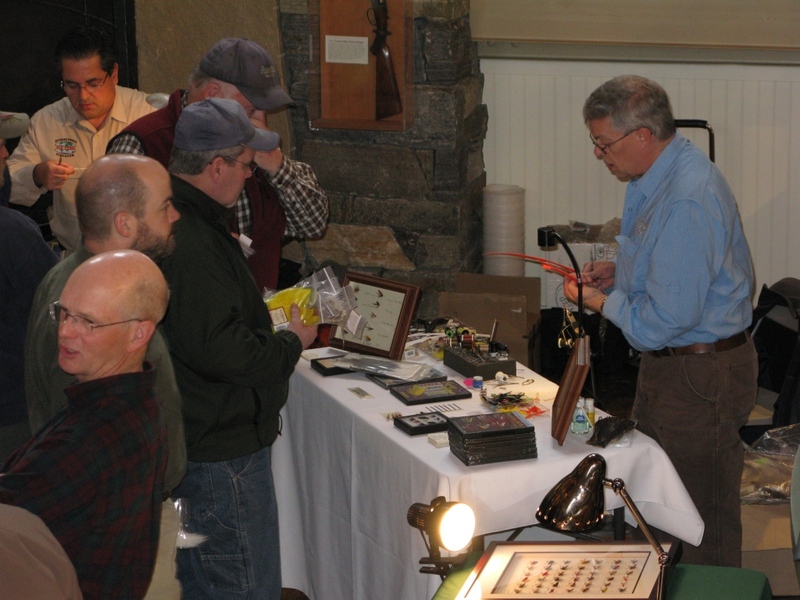 The date mentioned in his article is the first day of the L. L. Bean Annual Spring Fishing Expo, to be held on March 16 – 18. 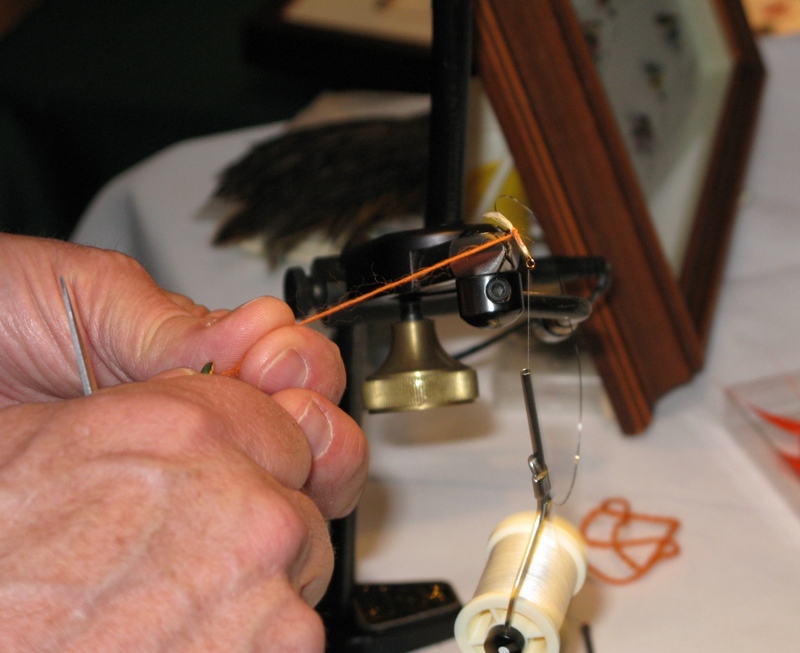 In addition to demo tying from 1 PM until 5 PM on the 16th, I will be leading the regularly scheduled Friday evening tying class at 7 PM as we collectively dress a Maine streamer pattern, the Footer Special. 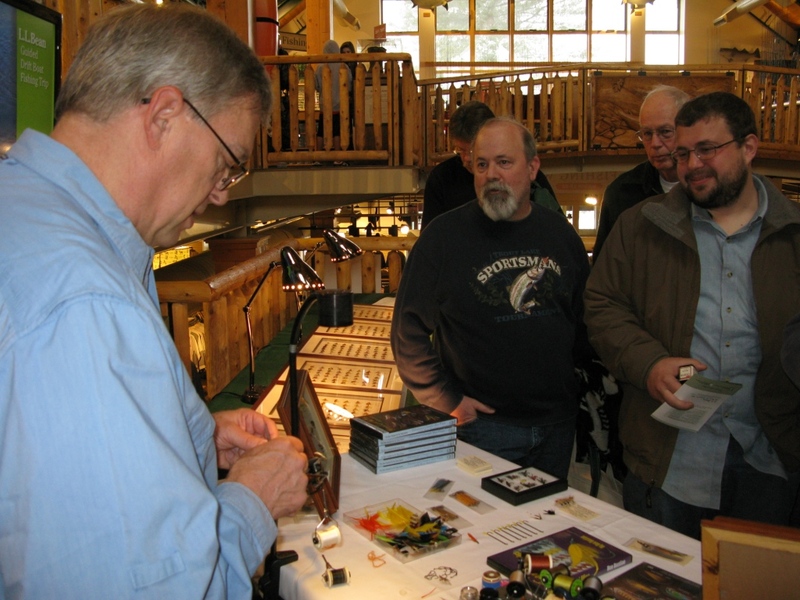 I am also one of the 2012 Expo Featured Fly Tyers and I will be tying classic wet flies and traditional streamers on both Saturday and Sunday from 10 AM until 4 PM. Here is the permalink to Quill Gordon’s entertaining post; it is worth checking out! I hope Quill won’t mind, but I borrowed one of the photos from his post so you would at least have something to look at here on my blog, since my picture files currently have nothing relevant for inclusion anyway. Besides I wouldn’t want to take anything away from his writing and photos. Thanks Quill, and as usual, nice work! 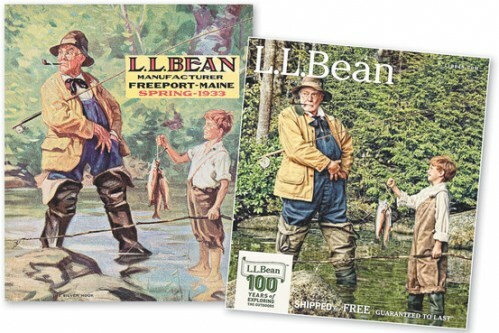 Original (left) and reproduced version of 1933 L. L. Bean Catalog Cover. The fish are or should I say, were, real and alive...but if Quill's facts are correct, PETA won't like the end result.